The Alfa Romeo RL Targa Florio (1923) calls to mind Alfa Romeo's first victory at the legendary Targa Florio in Sicily, and marks the birth of the Quadrifoglio Verde as the symbol inextricably linked to the sporting success of Alfa Romeo. 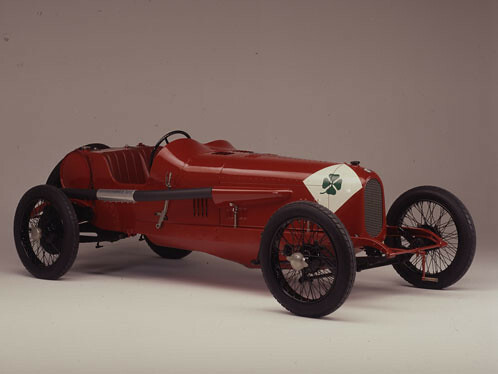 As a good luck charm, a four-leaf clover ("quadrifoglio") was painted to counter the racing number 13 assigned to Ugo Sivocci on the bonnet of the car he drove to victory. The Museum's car has the original engine used in the competition in 1923: a 6 cylinder in line with 3154 cc and 95 HP, propelling the car to a top speed of 160 km/h. The 1925 P2 Gran Premio was the first Alfa Romeo with an 8-cylinder engine designed by Vittorio Jano and the first Alfa Romeo to win a World Title in 1925 with Brilli-Peri. The P2's victories propelled Alfa Romeo into the pantheon of the most prestigious manufacturers, resulting in huge worldwide fame and opening its epic sporting period, a prelude to the success of the 1930s. The P2's eight cylinders in line result in a displacement of 1987 cc and power of 155 HP (175 in the latest version), taking the car to 225 km/h. The P2 made its début on the Cremona Circuit in 1924, a race which immediately demonstrated its superiority. The Alfa Romeo 8C 2300 "tipo Monza" (1931) also displyed at Techno Classica was designed by Vittorio Jano and boasts an 8 cylinder in line engine - two 4-cylinder blocks united by a central gear train - supercharged via a lobed compressor (two in the subsequent version). An expression of Alfa's technical superiority in the first half of the 1930s, this power unit allowed the Quadrifoglio cars to acquire countless victories: 24 Hours of Le Mans, Targa Florio, Mille Miglia, Spa-Francorchamps 24 Hours, international Grands Prix. 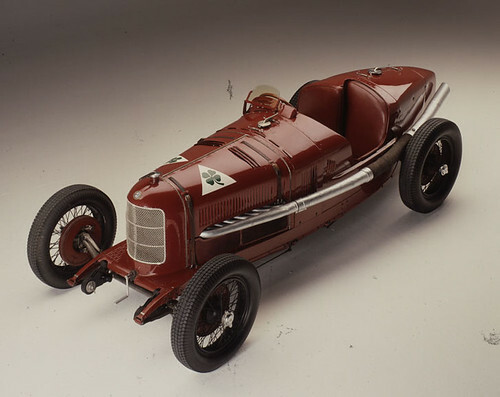 The 8C 2300 won on its début at Monza - hence the name "tipo Monza" - and it is with just such a car that Tazio Nuvolari won the 1932 Monaco Grand Prix. 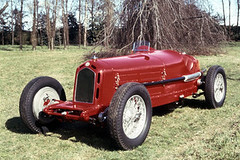 The "8C" engine concludes its sporting career with success at the 1947 Mille Miglia (Alfa Romeo 8C 2900B Lungo).